Kamchatka is one of the most remote regions of the Russian Far East. This spectacular peninsula lies between The Sea of Okhotsk on the west and the Pacific Ocean and Bering Sea on the east. Kamchatka is 1600 km (954 miles) long north to south and 480 km (300 miles) across at its widest, with a total area of 472,300 square km (293,334 sq miles). 10 time zones separate Kamchatka from the western Russian border. Enriched by the deep water Kurilo-Kamchatskiy trough passing along the eastern coast of the peninsula, the terrain is mostly mountainous, volcanic, with some seismic activity. 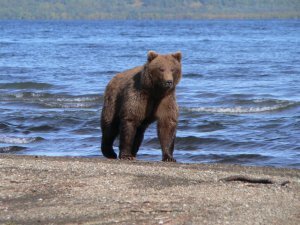 Flora and Fauna which abounds on Kamchatka has to be witnessed to be believed. 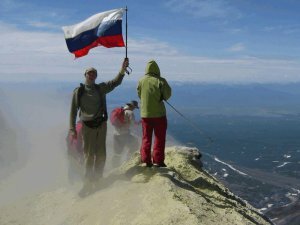 Two mountain ranges, Sredinniy (“Central”) and Vostochniy (“Eastern”), extend along the length of the peninsula and rise to 4850 m (15912 feet). Klyuchevskaya Sopka, the highest active volcano in Eurasia dominates the central valley of Kamchatka. The trough between these mountain ranges is occupied for much of its length by the Kamchatka River, the longest river on the peninsula. Kamchatka is a volcanic region and part of Pacific Ring of Fire. There are 129 volcanoes on the peninsula, 29 of which are active. 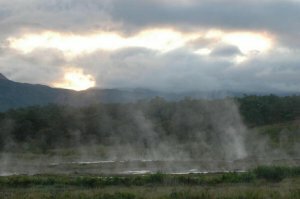 There’s also numerous hot springs and geysers. Most of active volcanoes lie along a fault line on the eastern flank of Vostochniy Range. The western coastlands of Kamchatka form a low plain crossed by many rivers with extensive swamps. In contrast, the eastern coast is dominated by broad gulfs and cliffed mountainous peninsulas. Kamchatka has a landscape of exceptional natural beauty with large symmetrical volcanoes, numerous lakes, wild mountainous rivers and spectacular coastline. It also contains superlative natural phenomena in the form of salmon spawning areas and major concentration of wildlife along the coastal zones. The untouched nature of Kamchatka makes it an attractive and fascinating destination. With cold and snowy winters and wet, cool and short summers Kamchatka continues to astound visitors with her majestic beauty. 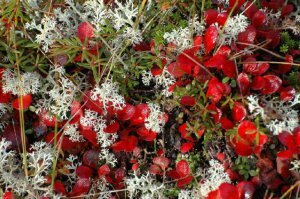 Predominant part of the peninsula is tundra, supporting mosses and lichens, with thickets of alder. Sheltered lowlands, notably the Valley of Kamchatka River consists of birch, aspen or larch forest, with poplar and willow in wetter areas. At present the population stands at 290 thousand people, most of which lives in Petropavlovsk-Kamchatskiy, its political, cultural and industrial center and a capital of Kamchatka.